The Integretek HyperLink FPGA core leverages the proven TI HyperLink technology connecting your FPGA design to a Texas Instruments C66X multi-core DSP at link rates up to 25 Gb/s. Developers can choose either an industry standard AXI4 bus or DMA interface. The HyperLink IP is available in both a x4 lane configuration and low cost x1 lane configuration. The HyperLink IP Core provides either an AXI4 master and slave bus interface for initiating single and burst HyperLink transactions or a vectored DMA interface. The HyperLink Vectored DMA interface provides a simple control interface and memory bus connections for initiating single and burst HyperLink transactions. 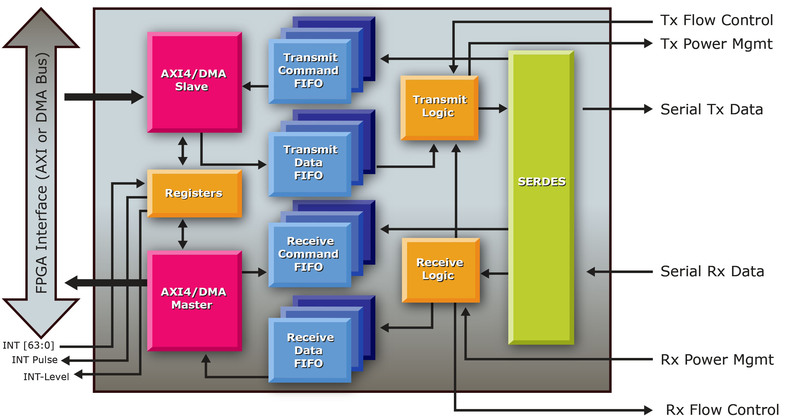 All HyperLink memory transactions are performed without any user setup or intervention.